8 ounces whole wheat pasta (approx 1/2 of the box package), cooked according to package directions. Once it’s cooked, drain the pasta and add about 1 tsp toasted sesame oil to keep pasta moist. In a large bowl mix peanut butter, hot water, sesame oil, rice vinegar, chili paste and garlic. Add the cooked noodles and your choice of add-ins and toss together. Other add-ins that would taste great (I didn’t have any): fresh cilantro, bell peppers, green onions, bean sprouts and toasted peanuts. This dish is very versatile and you can make the sauce according to taste. 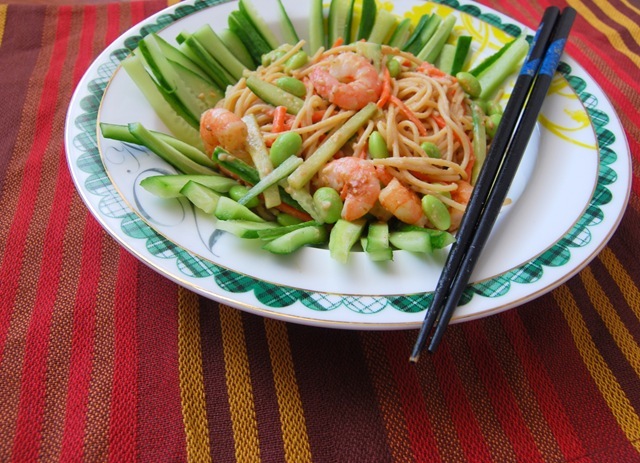 I’ve made it before without the peanut butter (which makes the dish just sesame noodle) or without the shrimp and it was still tasty. If you exclude the peanut butter, also exclude the hot water. 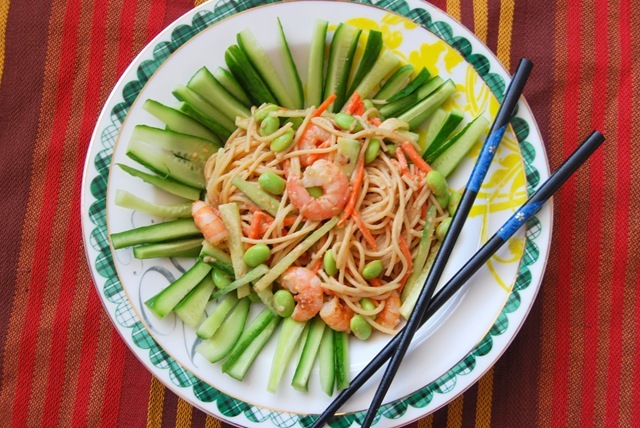 Have you had peanut sauce in your noodles before? 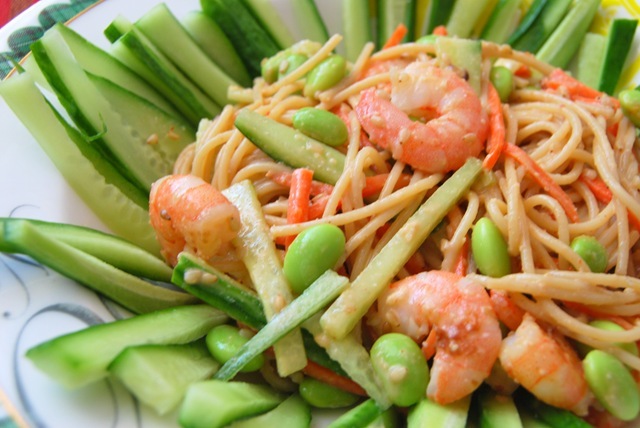 Or tried sesame noodles? Do you think for a peanut allergy almond butter would be a good sub?? This looks awesome! I think using almond butter will be fine. 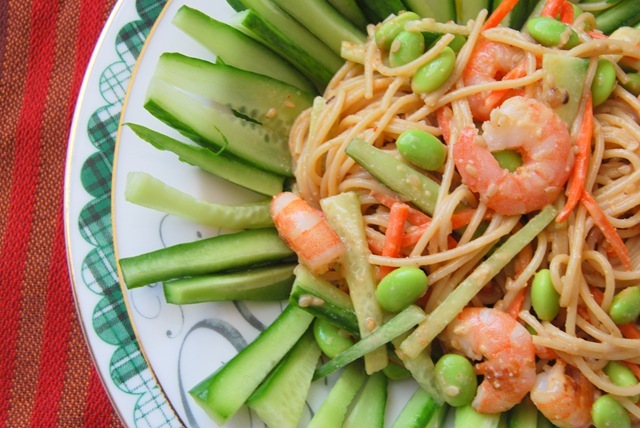 The soy sauce and the sesame oil usually over powers the peanut butter in this recipe. If you want to try doing 1 tablespoon almond butter/1 tablespoon hot water to start with, and then you can just add to more to taste. I’ve made this recipe without the peanut butter and it still tasted great 🙂 but I did add cilantro on that dish to add more flavor. Lea this looks delicious. I love peanut sauce on noodles! Lea, great presentation and beautiful pictures! This looks delicious. We should totally have a dinner party sometime. I would love to have a dinner party, maybe we’ll do a SoCal blogger potluck around the holidays. I love peanut sauces – especially spicy ones. Different noodles are fun to play with..as are different sauces. So when you requested some bread budding, I guess you didn’t want it with a side of shrimp? lol! eewwww. Hi Steph, thanks for checking out my blog. I love that peanut sauce can be used for a lot of food. With pasta, marinade for tofu and added to stir-fry. I love how you decorated the plate with cucumbers! So pretty!!! Everything looks so delicious! YUM!!!! I LOVE anything noodle-y with shrimp 🙂 I LOVE your presentation with the cucumber sticks. I love peanut and sesame sauce but I’ve never made it myself before! I enjoy soba noodles but have never cooked them myself! Something I need to do! This dish looks awesome! i love eating noodles it’s sorta my comfort food. this recipe sounds really appetizing and pretty darn hard to resist. thank you for sharing this. your pictures are so stunning. I tried this Noodle recipe and it called for Peanuts or PB and it was delicious..